Just when we are still celebrating our progress from the last 32 of the UEFA Europa League to the next, the organising body has come up with a regulation which will be a blow to us. 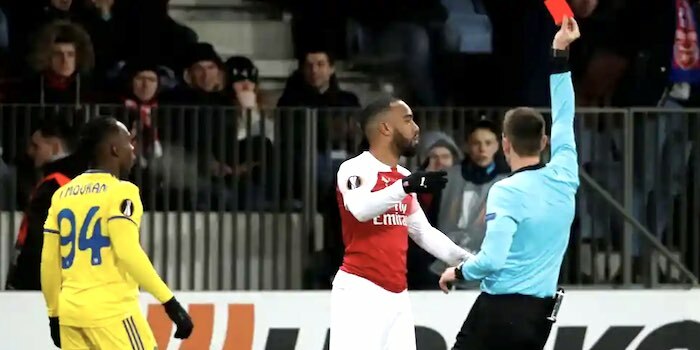 Alexandre Lacazette has been banned from taking part in any of the last 16 fixtures which will be against Rennes. The Frenchman was given a red card for raising his elbow in the last few minutes of the BATE Borisov clash in Belarus last week. That made him miss out of last night's demolition and when we thought it was all over, UEFA has raised its ugly head by adding two more to it. The European football body felt missing one game was not enough, so they decided to extend his absence. Should Arsenal fail to qualify to the quarter-finals of the tournament, then it will mean that Lacazette will not play any Europa League match again this season. 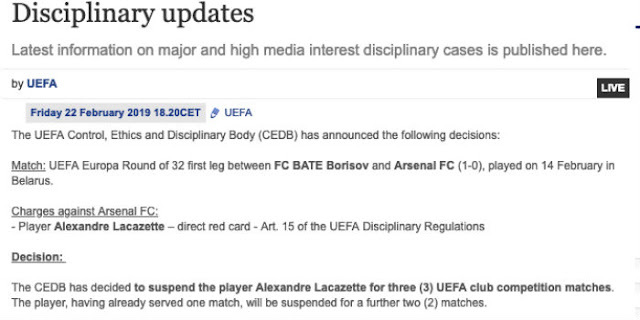 This is a bit ridiculous one from UEFA I must say but what can we do? It is one of those situations you have to cope with and I believe we will scale through.